This winter has sure been frigid and snowy! Luckily we have our hats, scarves, gloves, warm socks and heavy coats to keep us warm. But what about our four-legged friends who don’t have all that gear to protect them? Naturally, you’d think to keep your dog’s coat longer so they stay warm, right? Surprisingly, it’s actually better to keep your dog’s hair shorter during the winter months. 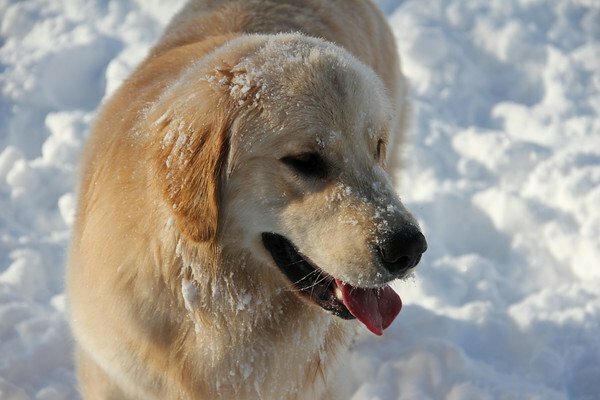 As you’ve probably noticed while you’re outside playing with your furry friend, a dog’s hair picks up snow like a magnet, and when their hair gets wet it mats faster. The mats block air from reaching the skin making the dog feel chilled and causing skin issues. Also, if the hair between their foot pads is too long, ice balls will form on their paws. The groomers at Purr’n Pooch Pet Resorts have primped and pampered many pups during the winter season, so they know which hairstyles are a dos and don’ts. Here are the top hairstyle picks from our groomers to keep your pet feeling fabulous while strutting stylishly in the snow. With this hairstyle, the dog’s body hair is cut short, but the hair on his legs is longer. This gives an illusion of a longer haircut. This is a grooming style that involves a simple uniform trim all over the dog’s body. The dog’s body, face, ears, legs and tail are all trimmed the same length, which can range from 1 inch to 1/4 inches long. Some dogs actually have a specific breed cut. These breed-specific standard haircuts have been established by the American Kennel Club (AKC) and are influenced by the dog’s historical purpose. For example, a Cocker Spaniel will get a Cocker Cut, where the body, head and face are short and sleek, but the hair on the ears, chest, skirt, legs and tail kept moderately long. For the snowy weather, we recommend a short Cocker Cut, where the legs and skirt are trimmed short. Other popular breed cuts include the Schnauzer Cut and Poodle Cut. 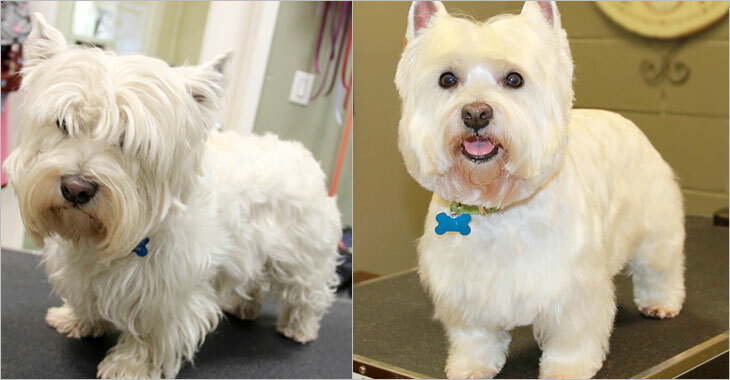 Many dogs come in regularly, typically every 4 to 6 weeks, for a basic trim. Trimming the dog’s hair will allow them to keep the length from getting matted. Like humans, pups also experience dry skin in the winter. At Purr’n Pooch, we offer a Strawberry Milk Bath for healthier skin and a soft, luxurious coat. The Strawberry Milk Bath revitalizes damaged and stressed hair and leaves hair shiny and clean. We also offer an Oxy Oatmeal Soothing Bath, which is great for soothing dry and irritated skin. Your pup’s paws may also be rough, dry, sore or cracked due to the winter weather. A great way to soothe and pamper your pet’s tired, winter paws is with our paw pad cream, which contains vitamin E and essential oils. It can be added to any spa or grooming package for $5. The cream is also available for purchase in our retail boutiques for $10. Bring your pet to Purr’n Pooch for the finest salon spa and grooming services. Our professional staff are experienced in all dog breeds, and will ensure that your pup feels and looks his or her best during the remainder of the winter season. Please call 732.842.4949 (Tinton Falls) or 732.528.8100 (Wall) to make an appointment.